Kelsey Reed, can you briefly walk us through your story – how you started and how you got to where you are today. As a enthusiastic childhood dancer, I always felt best in tune with my mind and body. 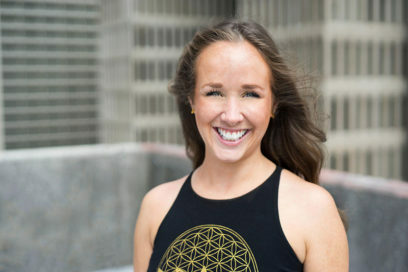 After a few failed high school attempts with yoga, I found my love for the practice in college during my parents’ divorce, heartbreak, and family addiction. Since 2009, I have been an avid yoga practitioner. 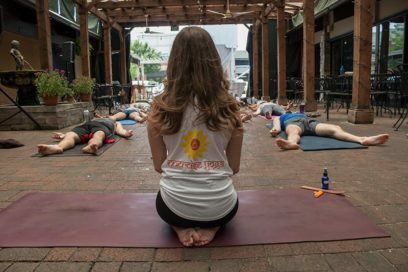 In 2012, I received my RYT-200 from Asheville Community Yoga Center and have now achieved my E-RYT with over 1,500+ hours of experience teaching. Since being certified and earning my degree in Health & Wellness Promotion at the University of North Carolina at Asheville, I have dedicated my life to sharing this practice to improve and motivate the health and growth of others. The road less traveled is never smooth, right? Unfortunately, the yoga community is not all yogic. There tends to be a competitive outlook on number of students in a class or admiration to those who have an advanced asana practice, neither of which are what yoga is really about. Social media and yoga combined has also been a struggle for me. I aim to remain authentic in my sharing, yet I am also a very private person. It’s been an interesting battle finding balance between the two. Please tell us about Innercise Yoga, LLC. Innercise Yoga is designed to balance the body, clear the mind, and activate awareness. Based on the fundamentals of Vinyasa yoga, this empowered flow provides a series of balanced asanas to enhance and expand not only your strength but also your center. In this expansion, the unconscious becomes conscious allowing the ego body to transcend to Universal Consciousness and ignite Divine knowledge. The intention of this practice is to cultivate this bliss in your daily journey. I specialize in Vinyasa, Yin, Restorative, Hatha, and creative flows. I teach mostly in corporate/private environments at the moment but host trademark Innercise events all over the city of Atlanta. I am most proud of my consistent effort to discover the true meaning of yoga and how to share it. What makes Innercise Yoga different is that I choose to intentionally incorporate yogic values and principles into my classes. I cue to enhance not just the physical experience, but the spiritual potential that yoga holds. It’s not all about the workout and most people who come to yoga are seeking that deeper meaning to life. Yoga is really more of a “work-in”… hints the name INNERciseYoga! Every year, we summered on a tiny island in Maine, called Vinalhaven. My best memories are crabbing off the house dock, catching and eating fresh lobster with the local lobstemen, and riding on the front of the boat singing “Born to be Wild.” These memories and this sacred place remind me of when I a, the most carefree and connected with Spirit.